Infinity Publishing calls itself an "independent (indie) book publisher," but since writers pay for Infinity to publish their books, I prefer to use the more traditional term: vanity press. The company has published a small book called Become a Published Author! It's aimed at prospective author-customers and explains how the company operates. It also includes some useful information on preparing a manuscript for publication. The 90-page book has a phony cover price of $14.95 that no one ever pays. Infinity gives it away for free. Independent sellers on Amazon.com offer new copies for 50 cents, and used ones for a penny! It also has another stated purpose, to provide a sample of a book that Infinity has published, to seduce customers. Ironically and stupidly, the book is made very poorly. It's simply ugly. The cover has very little contrast between text and a weird background illustration. The subtitle is A complete guide to Infinity Publishing's "just in Time" Book Publishing Method. "Time Book Publishing Method" should not have initial capital letters. A publisher should know this. So should an editor. In the past I've complained that companies such as Lulu never look at the books they churn out, assuming that if the author-customer approved it, it's good enough to print. As despicable as that attitude is, what Infinity has done is even worse. They apparently did not take a good look at a book their own employees put together to represent the company's best work. Inside the book, the margins on the pages are much smaller than on a standard commercial book, and the tops and bottoms of some facing pages are badly misaligned. The book's size is just 5.5 x 8.5 inches, smaller than the standard 6 x 9 inch size for similar books. Strangely, Infinity can't even print 6 x 9 books. 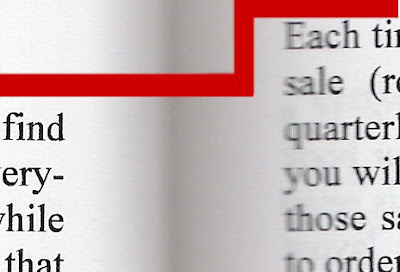 The company lies that "Most of our competitors can produce only 5.5" x 8.5" books." Infinity brags about being the only company that can print an 8 x 8 book. BFD! For most writers, 6 x 9 is much more important. The book both uses and recommends Times New Roman and Arial typefaces. Those are Microsoft's default faces and are widely shunned by publishing experts. Infinity brags about its "accomplished copyeditors" and that the editing service is "the best of its kind." They missed at least one silly typo. If this book is an example of Infinity's best work -- the sample they use to attract new business -- imagine how crappy their regular books are. The book says, "We only publish high quality books" and "As you hold this book in your hands, take note of the quality of the printing..." I did take note, and I almost barfed on the book. To dig their burial hole even deeper, the book brags that Infinity has invested millions of dollars in its printing equipment. They say, "Most of our competitors...involve a third party to print and ship books, yielding lower quality and less reliable fulfillment." I -- like many independent self-publishers and most of Infinity's vanity press competitors, and many major traditional publishers -- use Lightning Source to Print On Demand and ship books to booksellers and readers. I've never encountered a problem with fulfillment, and my books look infinitely better than Infinity's. The book was published in February 2009 and is badly out-of-date. It discusses saving files onto floppy discs or a Zip disc. It provides instructions on composing a book with the ancient year 2000 version of Microsoft Word. It says the company had published more than 5,500 titles since 1997. Even if we round that number up to get 6,000 titles in 12 years, it works out to less than 10 titles per week. It appears that Infinity is not a very busy publisher. Competitor Author House claims to have released over 60,000 titles since 1997. I certainly don't think that bigger is better, and I have no love for Author House or any vanity press. But I have to think that Infinity's poor quality must affect its sales volume, and the success of its authors. I have the 2002 version and it is about the worst set up book I have ever seen. Ever see footnotes overflow to the TOP of the following page? See pages 51-52.
but infinity is a self publishing site, isn't it?